There are still two weeks left to see the small works of art I currently have exhibiting at the Copley Society of Art in Boston, Mass. This is the fall member’s show, “In Full Color” and it really lives up to the name! I have a couple of my most colorful paintings in this show and hope they’ll find new homes before the show closes on November 8th, 2018. If you live in Boston or are visiting the city, be sure to stop by the gallery and take a look at the show. The piece on the left is titled, “Autumn Equinox” and is my idea of an “abstract” painting. It’s one of my newest watercolor paintings on Aquabord. Please visit my website for more info about this painting or give me a call! 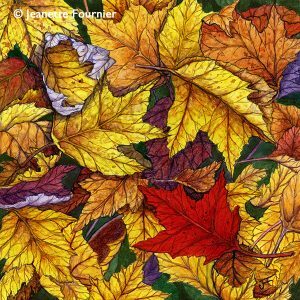 This entry was posted in Exhibitions, gallery news and tagged art exhibit, Autumn art, Copley Society of Art, fall leaves art, NH Artist, watercolor, watercolor art, white mountain artist. Bookmark the permalink.